The Bespoke Child Vitamin D provides 500iu of Food-Grown Vitamin D in a body-ready form and in easy-to-swallow capsules. Vitamin D is needed for normal growth and development of bone in children. Vitamin D contributes to the normal function of the immune system in children. Vitamin enhanced yeast (providing: vitamin D3), Vegetable cellulose (Capsule shell). Take 1 capsule per day, with or without food. Capsules may be opened and contents added to food or drink. 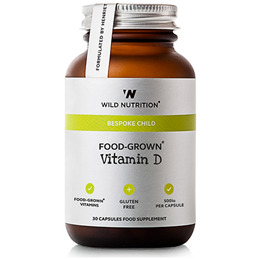 Below are reviews of Wild Nutrition Bespoke Child Vitamin D - 30 Capsules by bodykind customers. If you have tried this product we'd love to hear what you think so please leave a review.